A subscription website means big business for those who put the work in and successfully manage a group of members. Although you might not initially know how a subscription site works, it helps to think about some of the more popular subscription sites like Netflix, Hulu, Lynda.com, eHarmony, and Dollar Shave Club. Each of the examples mentioned above have vastly different products and all of those items are delivered to customers in distinct ways. For example, Netflix offers digital content, so there’s no need for any physical product logistics. Dollar Shave Club sends out boxes with shaving materials, meaning shipping comes in huge for them. Whether digital or physical, subscriptions can yield impressive profits since your company has a chance to bring in recurring income, much like that of a fitness center. Therefore, you have more of an incentive to keep current customers happy instead of constantly trying to acquire new ones. Subscriptions work nicely when done right, but the big question to start of with is how do you make a subscription eCommerce site in the first place? Unfortunately, no concrete answer exists. However, you do have several options to choose from. As you’ll see below, a few subscription-based services come with tools already built into the platform. This way you know that all of the requirements needed are there without having to go out and get an app of some sort. However, I’d recommend against creating a completely new site if you already have one. You might need to go out and find a third-party app if you’re already using a system like Shopify or WooCommerce. We’ll cover the costs and fees from each subscription solution, along with the more impressive features from each. After all, your subscription business depends on keeping costs low while also having all of the tools required to make your customers happy. LemonStand provides a full subscription suite without having to install a third-party app. Therefore, they’ve thought about the features needed and developed it into the LemonStand program. This sells me more than any third-party app potentially could, so if I were starting a subscription business from scratch, I’d definitely put LemonStand towards the top of my list. You don’t have to go out and find a subscription app that works for your business. Don’t pay any transaction fees. Plans start at only $19 per month. You might already be using a different eCommerce platform (therefore making it tricky to jump over to LemonStand). LemonStand limits monthly orders for each of its plans. You only receive email support. LemonStand was built for creating regular eCommerce sites, while Subbly focuses primarily on subscriptions and membership sites. This is a standalone subscription service like LemonStand, but it does allow you to integrate with previously built websites. One other thing to think about is that you’re not going to have a regular online store with Subbly. So this solution works well for subscription-only websites. You can integrate with any existing website. Design your shop without any coding knowledge. The notifications are really easy to configure. It’s one of the best options for beginners since everything is in one nice package. Subbly only allows for the Stripe payment gateway. They also charge a transaction fee (starting at 2%) on top of the Stripe transaction fees (2.9% + 30¢). You can’t make much more than a subscription website. Many online stores already combine WordPress with WooCommerce to make a scalable and highly customizable shop. Because of its opensource nature, WooCommerce extends into all sorts of site styles, and one of them involves subscriptions. In order to make a subscription site with WooCommerce you’ll need the WooCommerce Subscriptions extension. It starts at $199 for one site, and it provides features for multiple billing cycles, downgrading and upgrading, and manual renewal payments. WooCommerce Subscriptions supports around 25 payment gateways. After paying the one-time fee you’re no longer tied into any transaction fees or monthly payments. Re-billing is done automatically after failed subscription payments. The combination with WordPress allows you complete control over the site’s customization. At a minimum you’ll need WordPress, WooCommerce, and WooCommerce Subscriptions. That’s one CMS, a plugin and an extension. Although it’s not that hard to setup, there are other easier options for beginners. You’ll also need to complete tasks like finding your own hosting, working on SEO, and speeding up your site. The Subscription extension design is more about functionality, so you’ll have to design your own site or find a theme that works nicely with it. Rebillia with Bigcommerce serves as your best choice when making a subscription store with Bigcommerce. Bigcommerce has seen some problems recently over increased pricing for larger companies. We still think the less expensive plans are worth it, but you should be wary if your sales start hitting the $150K mark. Regardless, the Bigcommerce platform has incredible tools for making a standard online shop. 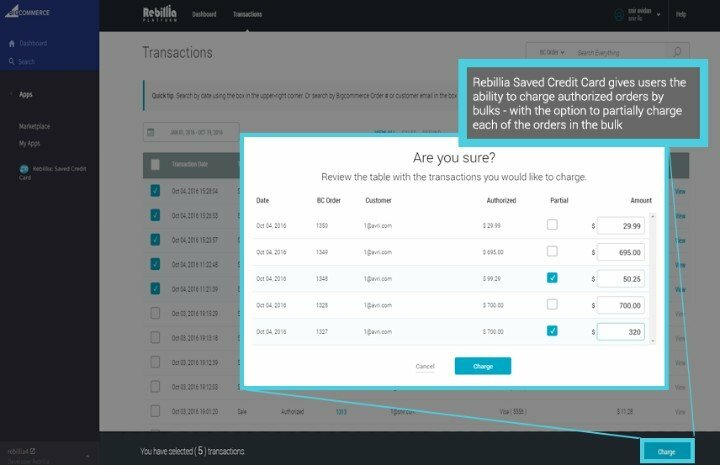 In addition, the Rebillia app has recurring billing features like bulk charges, history tracking, free trials, box subscriptions, and more. They have a built-in option for setting up a box subscription plan. Bigcommerce has wonderful themes so your design process won’t be that tough. Save credit card billing information, partially refund orders, and void mistaken refunds. You have to pay at least $20 per month for the app. Recent customer complaints about price increases have us concerned. Shopify is one of our favorite eCommerce platforms, but it doesn’t have the proper built-in features for running a complete subscription store. 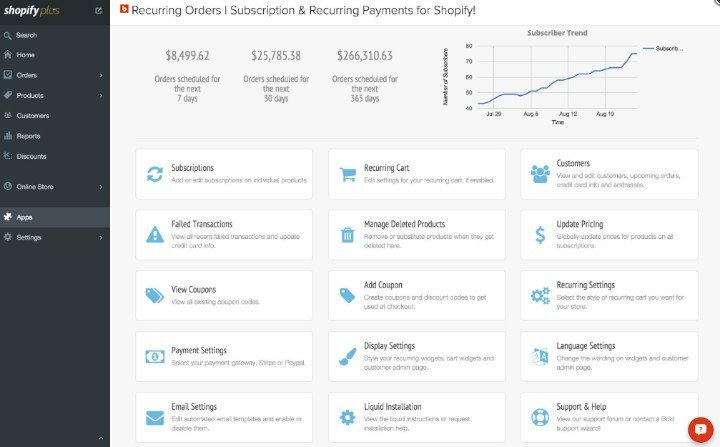 However, you can combine Shopify with either Recurring Orders and Subscriptions by Bold or ReCharge Recurring Billing and Subscriptions. Both are similar in pricing and functionality, with options for recurring billing, mixed cart subscriptions and PayPal support. You won’t be charged any transaction fees. Both apps integrate well with the Shopify theme designs. You get some interesting extra features like referral systems, bulk imports and shipping carrier integrations. The payment gateways for both apps are limited. You’re technically stuck with Shopify (which isn’t necessarily a bad thing). But this setup is only for new stores. The Magento Community Edition is opensource, so you get all sorts of online resources and you don’t have to pay a dime for the software. The Subscriptions and Recurring Payments for Magento 1 extension turns your site into a subscription platform, with duration and frequency modification options, trial periods, advanced payment processing and customer segmentation. You’re not hammered with additional transaction fees. The Magento Community Edition is completely free. The extension offers everything from configurable to simple product types. Magento is highly customizable, but like WordPress it comes with a learning curve. You don’t get support for grouped or bundled product types. 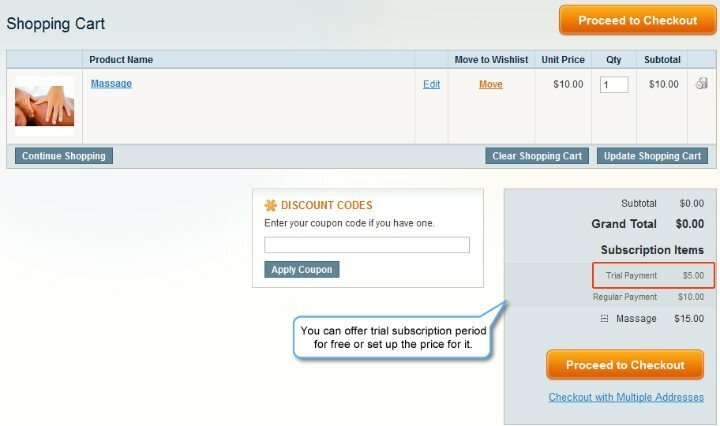 If you think Magento is confusing, the Subscriptions extension doesn’t make it any easier. The final viable solution for a subscription site is called MemberPress. This is a standalone plugin that integrates with any previously built WordPress site. As with WooCommerce, MemberPress involves installing an extra plugin and configuring it completely. The setup isn’t all that bad, and you get powerful membership controls, reminders, coupons, user accounts, and pretty much everything you would need for a subscription site. The $119 per year price point is rather affordable. It’s a complete suite with some of the most powerful subscription tools. Tracking and managing subscriptions is all done in the WordPress dashboard. There’s no need to open another page. It only has three payment gateways. Most people would run MemberPress by itself. I wouldn’t recommend having a separate store with regular products on it. Now that we’ve explored the most effective ways to build a subscription website, let’s take a look at tips for turning your site into a winner. If you don’t currently subscribe to a popular membership site, I recommend doing so for a few months. Take notes on how the entire process works, from user signup to the packaged or digital asset being delivered. Draw out the logistics to understand how your site can mimic the success. Just remember to find a subscription site that’s similar to your own. Subscribers expect big things from these types of websites. Make sure you have a solid customer relationship management module configured. Have eyes on your social media, forums, support tickets, and every area you have to communicate with members. From forums to local meetups, one of the best ways to shape VIP customers is to make them feel like they’re part of something special. No subscription site is perfect from the start. You’ll learn from your mistakes and receive all sorts of feedback from your customers. If you have the products to sell, get them online, and start testing the market. Go Make Your eCommerce Subscription Website! Now that you have the tools and advice needed to launch, get out there, and make it happen. Let us know in the comments if you have any questions about this article.